An ultra creamy vegan risotto with avocado and fresh herbs - perfect vegan comfort food! 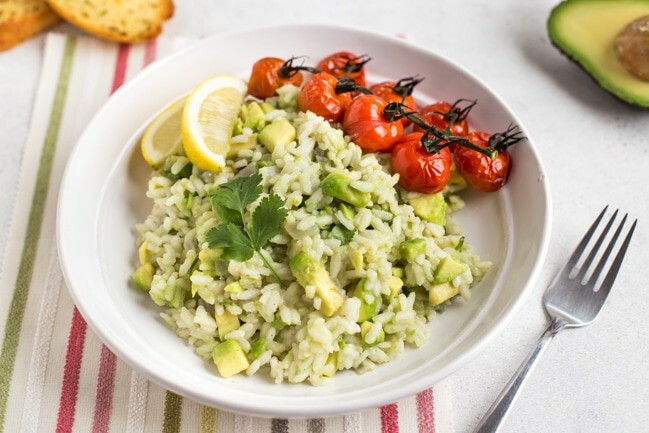 A creamy, indulgent avocado risotto – with no cheese! Vegan comfort food at its best. I’m usually not too inventive with avocados. Usually I just slice or dice them, and serve them as a garnish on top of some sort of TexMex dinner. Sometimes I try to be a bit more imaginative (avocado ice cream is truly amazing!! ), but I always think I should be creative with them more often. So to help me enjoy Veganuary, I thought I’d make something imaginative with one of my favourite vegetables (or, if you want to get technical, fruits), and I made this gorgeous avocado risotto – it’s creamy and indulgent, and totally vegan! 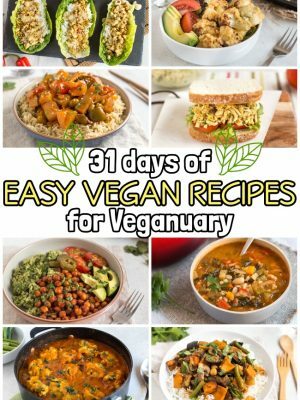 How do you make vegan risotto? Risotto might not be the first dish that comes to mind when you think about vegan food – it’s often loaded up with heaps and heaps of cheese. And while I can appreciate a good amount of cheese as much as the next person (…okay, probably more), it’s not exactly vegan-friendly. But luckily, a lot of the creaminess of a good risotto actually comes from the rice itself, not from added dairy. When you stir the rice, it releases its starch, and helps to create that beautiful creamy ‘sauce’ – no cheese required. 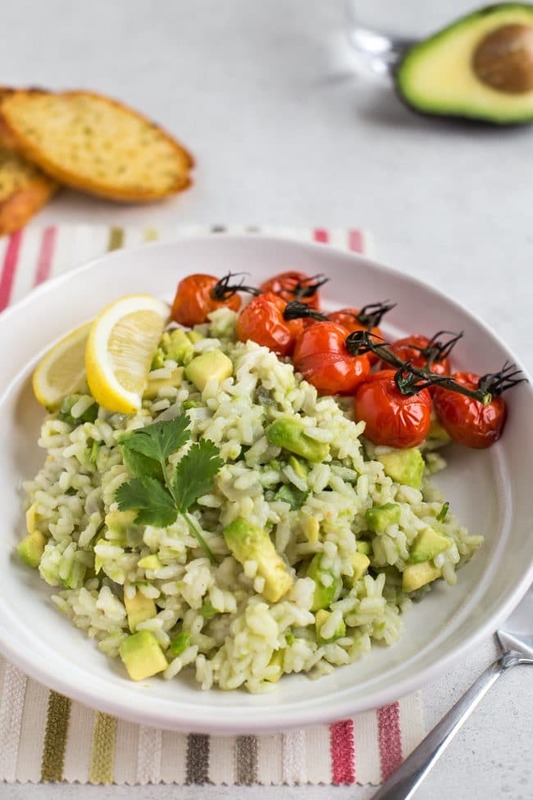 This avocado risotto recipe begins with a basic ‘white’ risotto – just onions and garlic, cooked with arborio rice and good quality vegetable stock. Add the stock a little at a time, and stir the dish regularly, for perfectly creamy rice. You can even add a good glug of white wine if you fancy it. 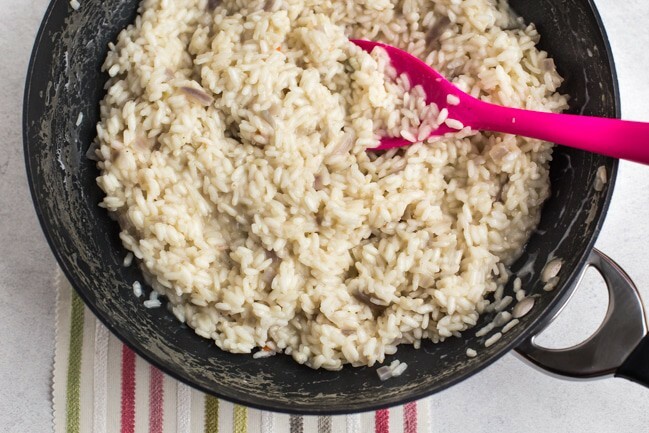 Of course, you could just stop there – you’ve already made a simple vegan risotto. It’s delicious as is, but it doesn’t have a huge amount of flavour, so you’ll probably want to take it up a notch – and what better than to add the creamiest vegetable on the planet, avocado! 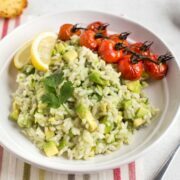 You’ll want to use nice, ripe avocados for this avocado risotto – you want them to be slightly soft to the touch. 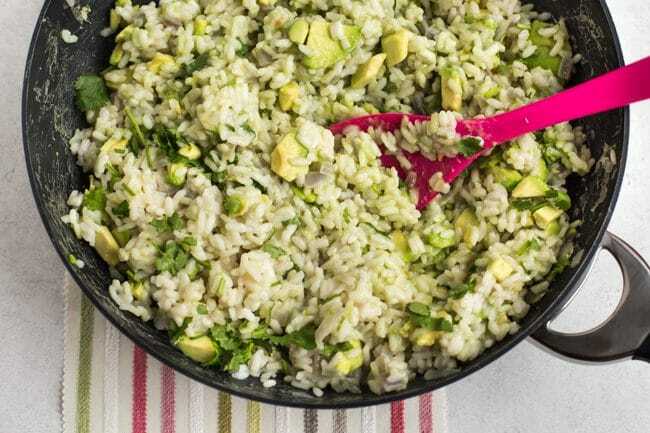 If you use unripe avocados, you’ll just end up with hard pieces of avocado in the risotto, and it won’t actually add to the creaminess of the dish at all. If you use super ripe avocados, though, they almost melt down through the rice, and really help to amp up the luxury. Some of the avocado remains in pieces, and the rest gets mashed right through the rice. Finally, just add a good squeeze of lemon juice, some fresh herbs, and plenty of salt and pepper, and you’re done! 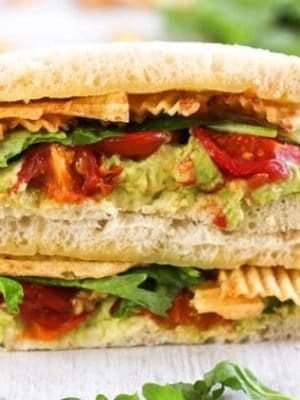 The flavour is mild and creamy, and the avocados really shine through – perfect for avocado lovers! Can I make risotto in advance? Absolutely! Risotto is actually one of my favourite things to cook for dinner parties, because you can have it all cooked in advance, then just reheat it when your guests are ready. The only thing to remember with this particular risotto is that, despite the squeeze of lemon, avocado does brown a little when it’s exposed to the air for long periods – so if you cook this risotto the day before you need it, and leave it in the fridge, it will definitely look less attractive the next day. If you do need to cook your risotto in advance, I’d just stop halfway through the recipe, and then add the avocado at the last minute, when you reheat the rice. As with all rice dishes, make sure you cool it quickly, store it in the fridge, and then reheat it really thoroughly before serving. And there you have it! A rich and creamy avocado risotto that makes the perfect vegan comfort food. Heat a dash of oil in a large, deep frying pan or wok. Add the red onion and garlic, and cook over a medium heat for at least 5 minutes, until soft and fragrant (you don't want it to brown). Add the uncooked rice, and cook over the heat for 1-2 minutes, stirring constantly. Then add the vegetable stock a little at a time (I usually add about 250ml / 1 cup at a time), stirring regularly and allowing any excess liquid to be mostly absorbed each time before adding more. Continue cooking the rice like this until it's cooked to your liking - I needed around 5 cups of stock in total, but you don't need to use the full amount, or you can use a little more, depending on your preference. Remove the flesh from the avocados, and cut into small chunks. Use a fork to mix it into the risotto, mashing some of the avocado and leaving some of the chunks whole. Add the lemon juice, chopped herbs, and salt and pepper to taste, and mix well to combine. Make sure the risotto is piping hot, then serve. Love unusual ways of cooking with avocados? 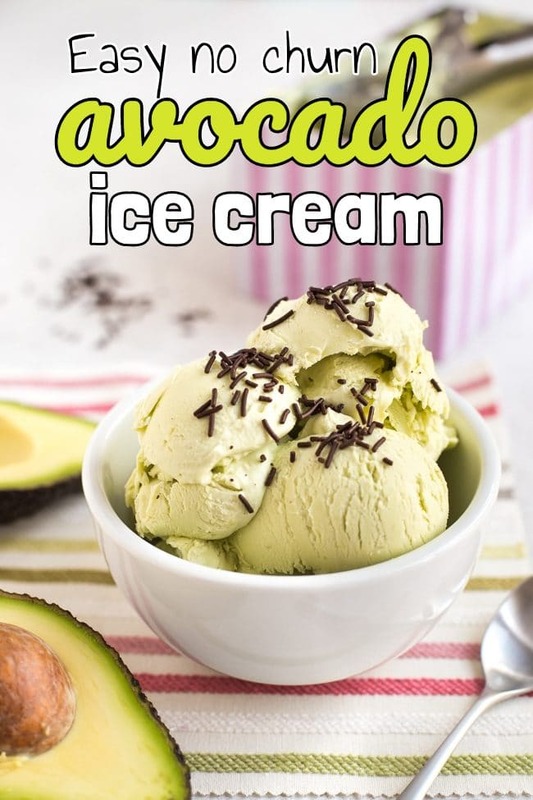 Try avocado ice cream! I love avocado, and I love risotto, so you hooked me in. 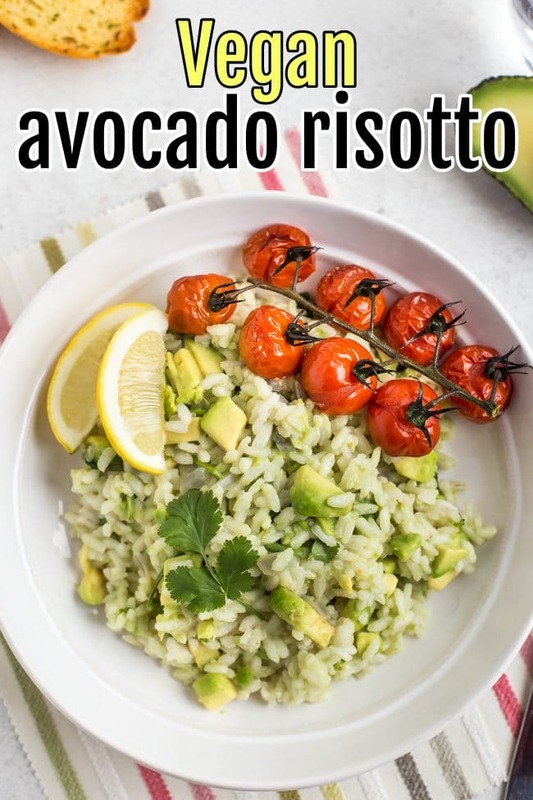 I actually tried to make something simialr a while back but it turned out way too bland, so I’m interested to give this a go this weekend and (take credit) show the rest of the fam that avocado and risotto is a delicious food marriage! I have no idea about but I thing i have to try it in my home because I love vegetarian menu. Thank you so much for sharing this wonderful idea. I like the dish because its simple and easy to cook. What would you serve with this for dinner? Hi Brian! You can serve this just how you would serve any other risotto, so maybe with some salad and garlic bread or something :) You could also add some extra veggies if you like – maybe a big tray of roasted veg on the side? Hey, I just discovered your blog through Pinterest, and this recipe looks great! Also, as someone studying and teaching English, the name caught my eye (love it). I have been trying to reduce the amount of meat I’m eating and possibly become completely vegetarian eventually. I was wondering if anyone has ever cooked this with liquid stock, and if so, do you still add water, or all stock? I don’t usually buy the cubes, so I was just looking for some feedback. Thanks! It doesn’t matter if you don’t use stock cubes – just use liquid stock instead of the water and cube :) enjoy! appx how much do the avocados weigh ? Hmm I’m not sure! They were a bit bigger than fist-sized though, if that helps. Looks of the stuff are so amazing. And for a change I was able to prepare it right in my first attempt. Enjoyed it. Thanks for the party! Will revisit your website again and again in search of more and more amazing dishes. Omg, I cant wait to make this, thank you! I have everything to make it and while hubby was expecting so ething different for dinner, we are having avocado risotto! 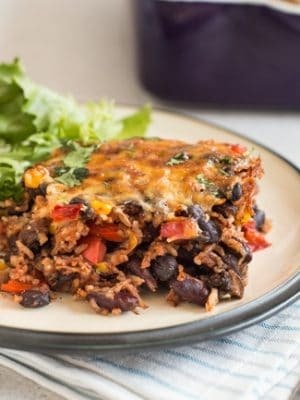 I just stumbled across your blog via a pin on Pinterest about bounce rates, clicked on your About page, went ‘Ooh, she’s British!’, then got distracted by a picture of this recipe. I am another avocado fan, and I can’t believe I’ve never thought to put avocado in risotto! This looks amazing! Glad I found your blog, I will definitely be coming back for more! 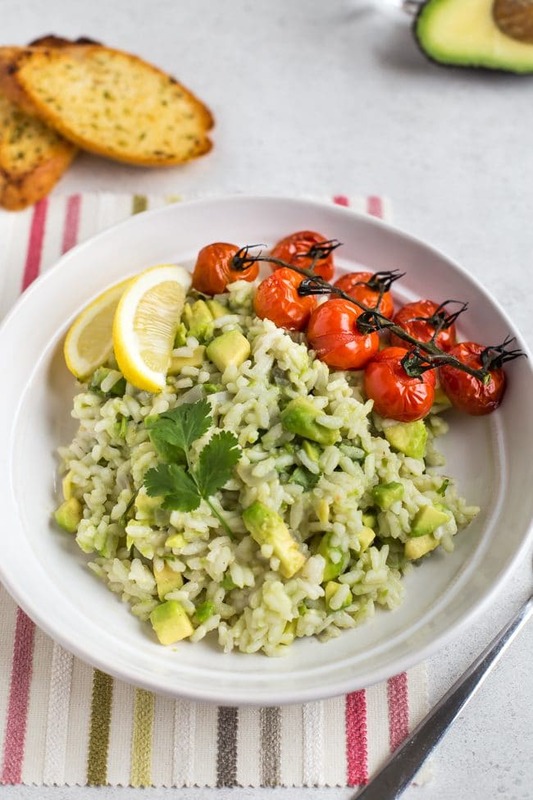 Ehem, i’ve never had risotto with avocado before, but wow, that looks great. Will definitely try it out sometime. I’ve never seen avocado risotto before! It makes sense though since avocado is so creamy….such a great idea! i looooove avocado!! i usually give into the same temptation and just eat them on toast with lemon juice. maybe next time i’ll branch out like you and try this because it looks amazing! As an avocado fanatic, I wholeheartedly endorse this recipe =D. Strangely enough, I’ve never made risotto with avocado (though I’ve eaten it in restaurants)… This looks and sounds fantastic, though!